Thanks again to Jeff Koehler for the great flaws/off-flavors tasting! Check us out on the Examiner. Acetaldehyde, Diacetyl, DMS, Isovaleric, Geraniol, Butyric (my favorite) and a few others down, about 16 more to go! Session 2 coming soon; check back for details or subscribe to our mailing list. 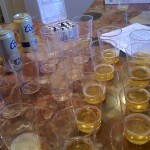 A huge thanks to Jeff Koehler for leading us through a great beer flaws & off-flavors tasting session. 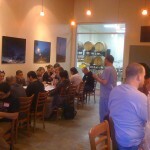 We had a huge turnout, and [intentionally] crappy beer was enjoyed by all! Stay tuned for the date of Session 2, likely sometime between Thanksgiving and Christmas. Many thanks to our friends at Eagle Rock Brewery as well for letting us commandeer their tap room. Great response to the invite for the off-flavors session. 20 of 20 seats have been spoken for, but if you have not yet attended and really want to come let me know (mail lee at bakofsky.com); most likely someone signed up will be unable to attend, or we can stretch our samples a little further. Looking forward to seeing you all soon! You’ve likely heard terms such as diacetyl, acetaldehyde, DMS, and so forth in the context of beer flaws and off-flavors, but what do they really taste like? Join is Saturday, November 13 for the first in a series of sensory analysis sessions to find out. We’ll conduct a tasting of ‘doctored’ beers, each highlighting a specific flaw. Prepare to savor such flavors as cardboard, green apple, creamed corn, and if you’re lucky maybe even a little baby diaper! This is a great opportunity, particularly for newer brewers, to learn to identify beer flaws and troubleshoot their process. If you have any beers that didn’t turn out as you’d planned, bring them along! (Feel free to bring good beer as well). We have room for 20 people, so please RSVP to me so I can keep track. To cover the cost of the off-flavors kit and beers we’ll take up a collection of $5 per head. We’ll be meeting at 2:30 PM at Eagle Rock Brewery, and will stick around for a pint or two after the meeting once Eagle Rock’s tasting room opens (4:00).